Albert Pujols launched two home runs, Roy Halladay looked every bit an ace and Barack Obama pulled out a White Sox hat to make his presidential pitch. Still, no one had a bigger blast on opening day than Jason Heyward. In New York, there were a few boos. After seeing their club crippled by injuries last season, Mets fans heckled — of all people — the team trainers. Tough crowd! A day after Boston beat the World Series champion New York Yankees in the major league opener, most everyone else swung into action. On a huge sports day in America — the NCAA men's basketball championship game, the Tiger Woods news conference — baseball delivered a full first day. There were 13 games on the schedule, plus a bid for history. Toronto pitcher Shaun Marcum took a no-hitter into the seventh inning at Texas before it got broken up. His effort was even more remarkable because he missed the entire 2009 season with elbow trouble. "What a way to start the season," Toronto manager Cito Gaston lamented. "We start with almost a no-hitter and it leads to a loss." Some four hours before first pitch between the Mariners and Athletics at the Oakland Coliseum, Seattle players warmed up by tossing around a football in right field. The black clouds had parted in the Bay Area and blue skies emerged. For 40-year-old Ken Griffey Jr., it was time to enjoy another opening day. "They're always special, the start of six months of baseball," the Mariners star said. Obama drew a loud ovation when he continued a tradition that started 100 years ago with William Howard Taft — the presidential first pitch. He warmed up with some practice tosses at the White House but really, the lefty could use a little more time in the bullpen. 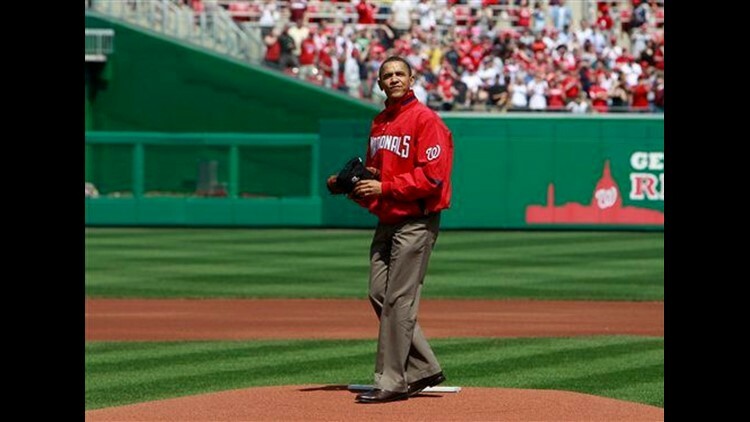 Obama double-pumped, rocked on the mound a few times and made a high-and-wide flip to the plate that Washington third baseman Ryan Zimmerman snared. It probably helped, too, that Zimmerman was coming off winning his first Gold Glove. At least Obama, whose smooth stroke on the basketball court is well documented, put more oomph into it. Last year, he barely reached the plate at the All-Star game. "If I had a whole inning, I'm telling you, I would have cleaned up," he said. A White Sox fan, Obama waited until he got to the mound to pull on his Chicago cap. "I said at one point when he had a Nationals jacket, 'I don't think I've ever been at a game when you didn't have a Sox jacket, and he said 'I've got something coming,' and sure enough out came the White Sox hat," commissioner Bud Selig said.